Bhut Jolokia-(Capsicum chinense)-The Bhut Jolokia is one of the hottest chiles in the world. Tested in 2006 by Dr. Paul Bosland of New Mexico State University it broke the previous heat record held by the Red Savina. The Red Savina was found at 577,000 Scoville units in a single test in the early 1990's. Multiple tests done by Dr. Bosland and other labs came in at over 1,047,000 Scoville units and it was promptly awarded the new Guinness Record for chile heat. The Bhut Jolokia also know as the Ghost Chile comes from the northeastern provinces of India just north of Bangladesh. Most of it today is grown commercially in Assam, India. It is also called by many other names like Naga Jolokia, Bih Jolokia and Ghost pepper. 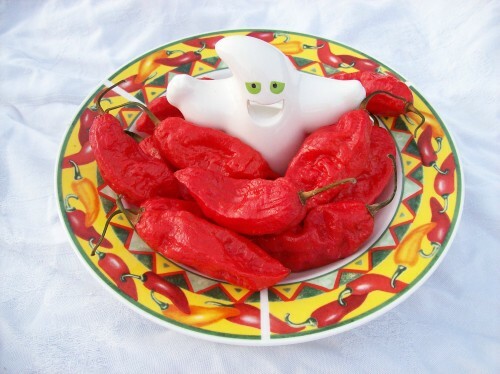 It is called the Ghost by natives because after eating the Ghost chile some are devastated by the heat and look so bad as if they have seen a ghost! YOU ARE BUYING SMOKED GHOST CHILE POWDER BY THE KILO. IF YOU WANT LARGER AMOUNTS FOR MANUFACTURING CONTACT ME FOR BETTER PRICING STRUCTURE. IF YOU ARE OUTSIDE OF THE UNITED STATES AND WANT LARGER AMOUNTS CONTACT ME. THIS PEPPER POWDER YOU ARE PURCHASING HAS BEEN FROM PEPPERS GROWN OUTSIDE THE UNITED STATES.